Crystal Palace manager Alan Pardew says he is proud of his work at Newcastle United as he prepares to face them in the Premier League on Wednesday. Pardew spent four years in charge at St James' Park before resigning in December to move to Palace. He accused Newcastle fans of "mass hysteria" in September after they criticised a poor start to the season. "I thought I did a good job and walked out with my head held high, and so I'm looking forward to the game," he said. Pardew guided Newcastle to finish fifth in the Premier League in 2011-12, but his relationship with the club's supporters deteriorated earlier this season. The club were bottom of the table after picking up four points from their opening seven matches, with fans calling for both Pardew and club owner Mike Ashley to leave. Newcastle had climbed to ninth by the time the manager departed at the end of December, with John Carver taking over as interim boss until the end of the season. 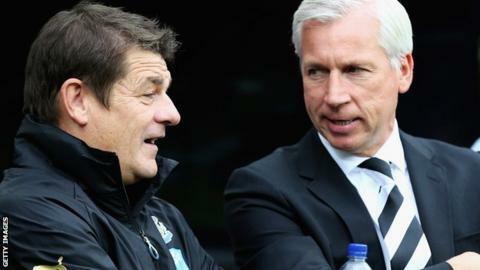 Pardew says he is unconcerned about how Newcastle's fans will react at Selhurst Park on Wednesday. "I'm not expecting or hoping for any reaction," he said. "We had some great times together. It was not so great the last year, but on the whole my experience there was great." Was football better before 1992? Read more on Was football better before the Premier League?